If you were driving from Indiana to Atlanta for an early family Christmas and a friend called you and said, “The Hooch is blown but there’s a small chance we can fish some water in north Georgia. 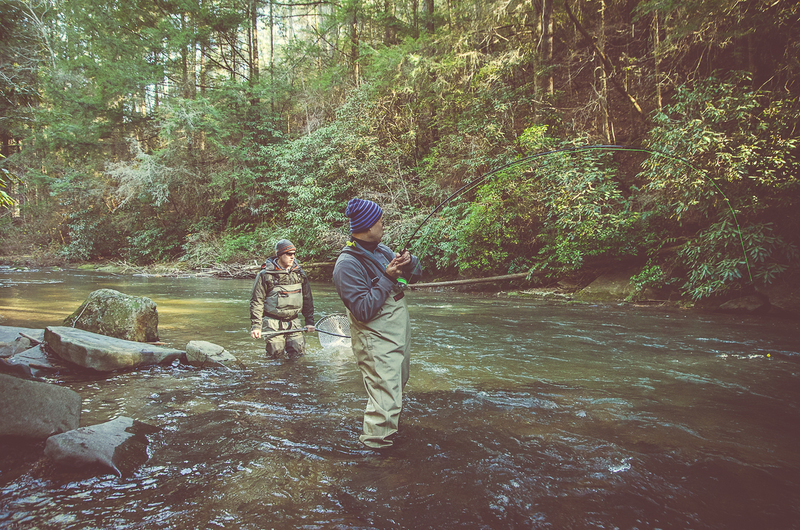 The place is called Brigadoon Lodge​ and is renowned for giant rainbows and browns that will make your head spin. Would you be good with that?” Would I be? 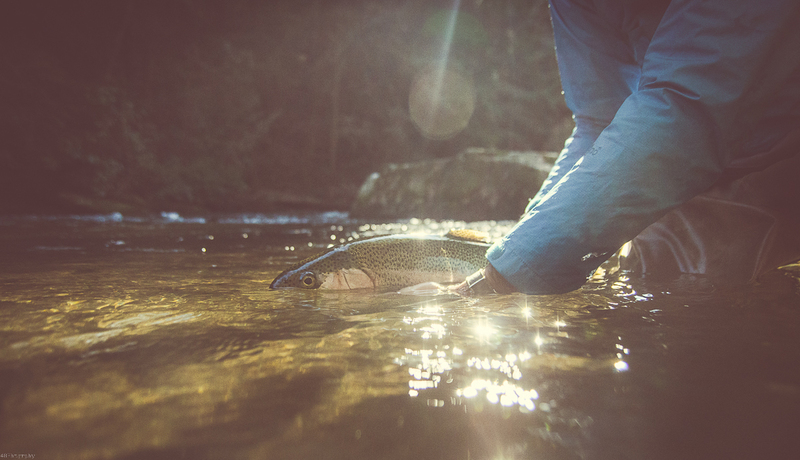 I love learning new waters and that was good enough for me but hearing about and seeing pictures of these fish was icing on the proverbial cake. I had an idea of what and where Greg was mentioning but having an idea and actually experiencing Brigadoon are two totally different things. Sometimes the expectation turns out to be better than the experience and that was just not the case here. It’s been two weeks since I willingly froze my fingers in the Soque River and I’m still awed by the trip. I arrived in Georgia and the next day our friend Nate called me telling me that he was also in town for the holidays. This trip just got dialed up to eleven. I get to spend a day on some of the most beautiful water I’ve ever been on with some of my favorite people on this planet? I felt like that dad in A Christmas Story when he wins a major prize. On Saturday morning I picked Nate up and headed over to Greg’s for the drive north. We arrived at Brigadoon Lodge and Greg gave us a little tour of the grounds. We entered a huge cabin called Oban that sleeps four people and is a few steps from the river. We didn’t see the other cabins, but you can check them out on the Brigadoon Lodge website. 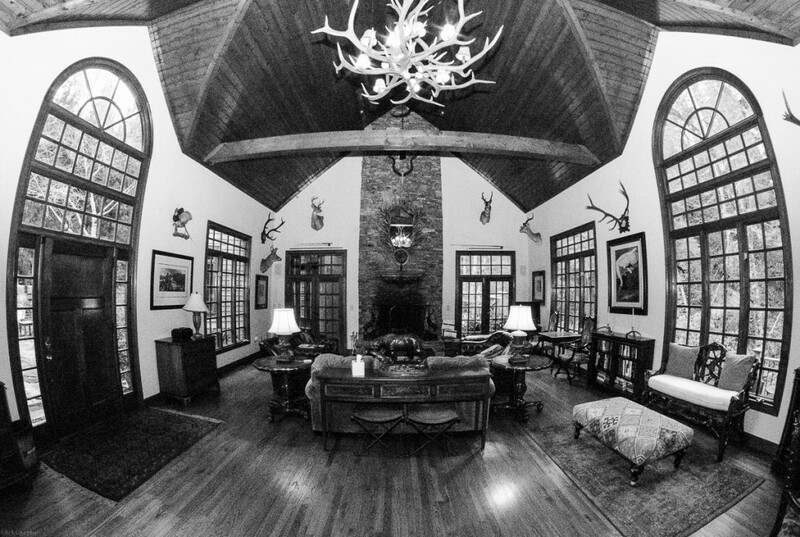 We then walked into the lodge and both Nate and I were awed. It is reminiscent of the classic east coast lodges of old, the type you read about in old trout books from a hundred years ago. I could picture sitting around the fireplace with friends, drinking whiskey and warming up after a long day of catching giant trout. It’s definitely a place with a magical feeling to it. We walked around the property for a bit and then wadered up which was welcomed because it was cold for the south. The natural terrain of the area, with a giant cliff face and huge trees, lends itself to great privacy but also doesn’t let the sun warm up the grounds until it’s directly overhead. 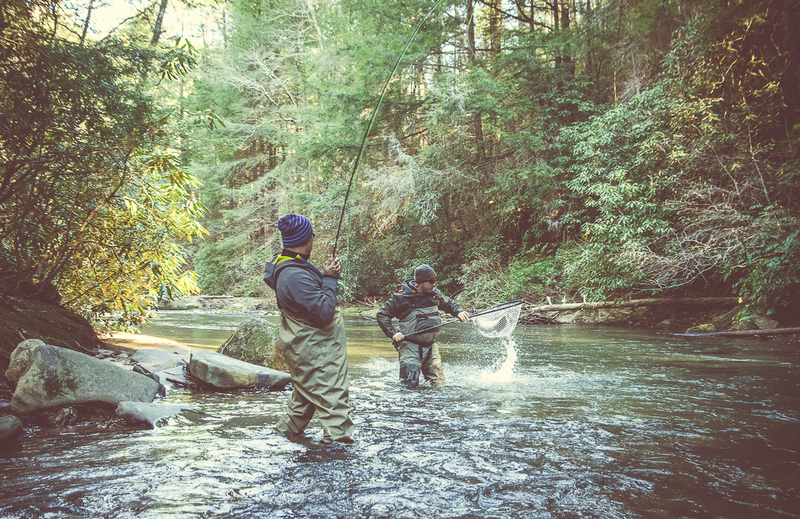 If you do fish Brigadoon in the winter, remember to bring hand warmers and extra gloves. 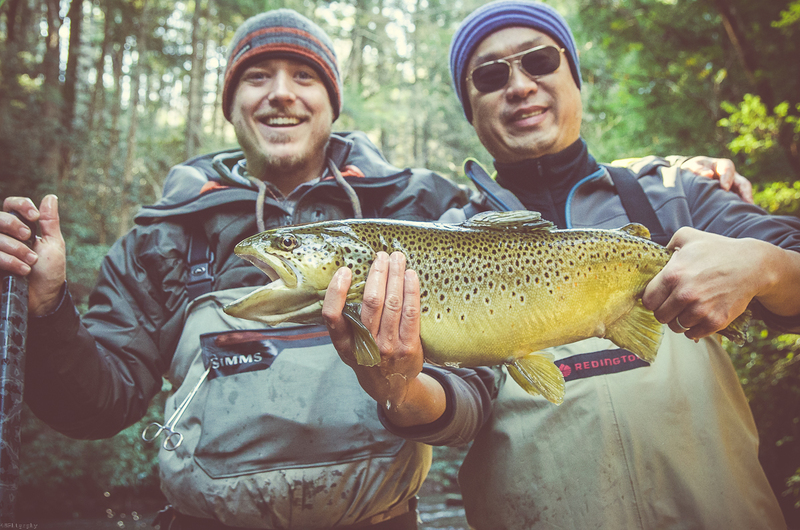 While we were gearing up another guide named Cameron showed up with his client, Rich. We chatted for a bit and they headed off to find some of the mythical monsters that reside in the Brigadoon waters. We walked the riverbank downstream and the insanity began. I’m a streamer guy. I don’t like to nymph but it’s just a preference. I like to see the angry take of a predatory fish. I tied on an articulated pattern and Nate started off nymphing. I was immediately hit by a freight train of a trout and my leader was snapped like it didn’t exist. Shock, happiness, confusion, and a few more emotions all hit at once. “HOW did that fish just break me off like I wasn’t even there? !” I exclaimed. 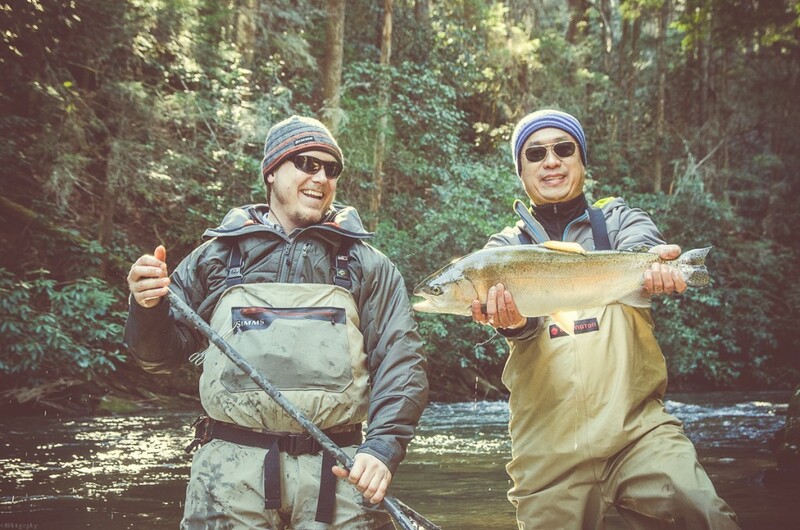 Greg was laughing from the riverbank and said it had to have been one of the 30″ fish that live in these waters. Small, fast mountain streams plus giant trout equals an intense battle when you do hookup. You basically hold on and hope. I’m not even kidding in the least. The only thing I could compare it to was fresh pre-spawn salmon in their power. We caught a few fish here and there but the fishing was slow which you can’t really complain about when you’re at a place that looks as beautiful as Brigadoon does. We were hooking up with good fish when we did get one on the other end of the line. Even the “small” fish are nothing to overlook but I even felt myself looking at high teens trout as small which is crazy to me when I think about it. 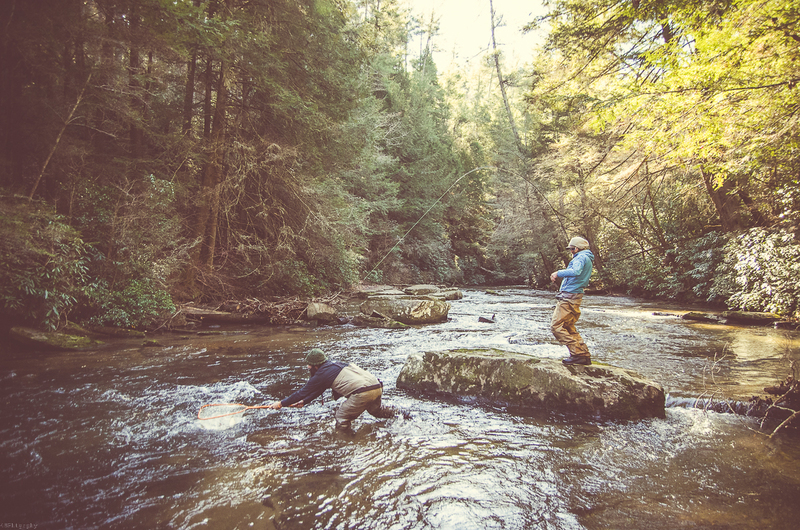 Brigadoon can and will spoil you and if you’re new to fly fishing for trout, it might just make you an addict after your first fish. 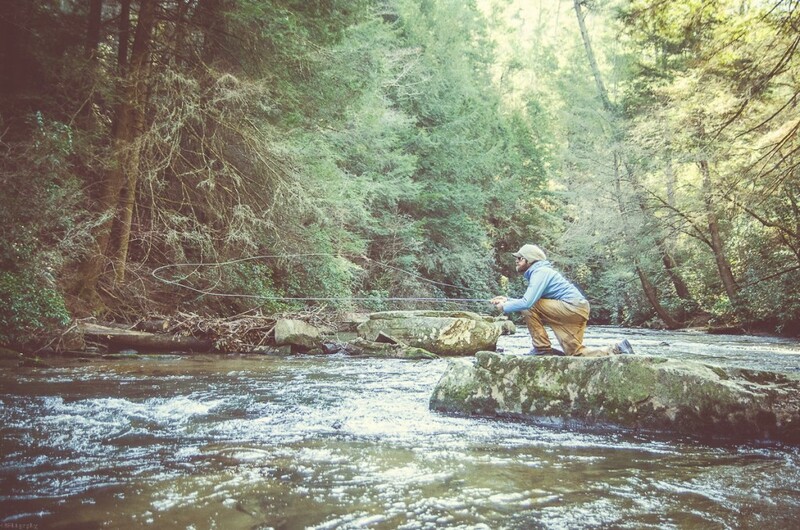 Then again having an addiction to fly fishing is not the worst thing in the world, is it? A few hours later Cameron and Rich were working their way downstream and we met up with them. Cameron had Rich start working a run as we watched from the bank. Rich was immediately into a rainbow. a really good one too. He fought it for a bit and Cameron slid the net in for a perfect net job. 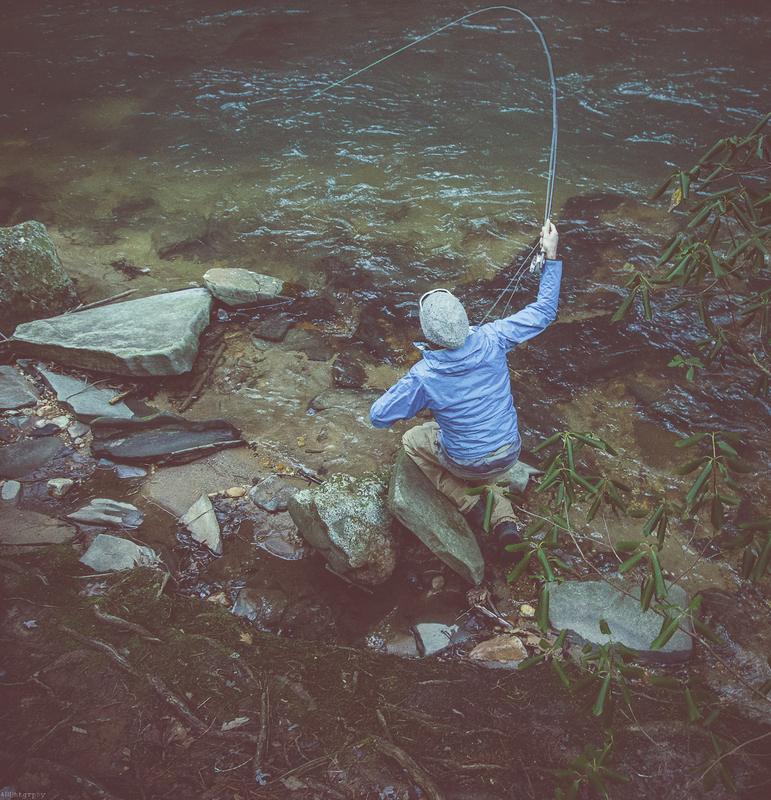 Rich immediately tossed his fly back into the run, which was deceptively deep, and a few casts later he hooked into a really nice female brown trout and after a quick fight the fish was landed, photographed, and released. We let them get back to their fishing and headed upstream where were started picking up a few fish here and there. We saw the palomino trout and attempted to get them to eat but the fish that resemble neon lights underwater laughed at our futile attempts. I did have a nice palomino slash at a streamer a few times but a fish that you can see from fifty feet laughed at me and I honestly didn’t feel bad about it’s pea sized brain outsmarting me. The day was growing shorter and Nate and I had to get back to the city for our families Christmas dinners so we almost unwillingly cut our flies off and threw the wet waders in the truck. 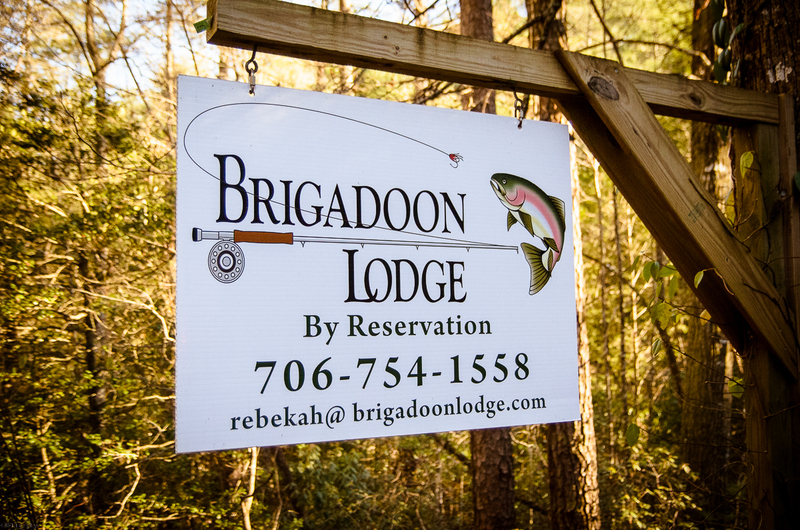 Brigadoon Lodge is a place that even if you only get to experience it once in your life, it’s worth it. I plan to return some day and stay in the cabins so that I can sit around a roaring fire with good friends, sharing stories and relaxing in a little slice of heaven in Georgia. Chrix said, God dammit man. Sounds like a hell of a time and the photos are incredible.